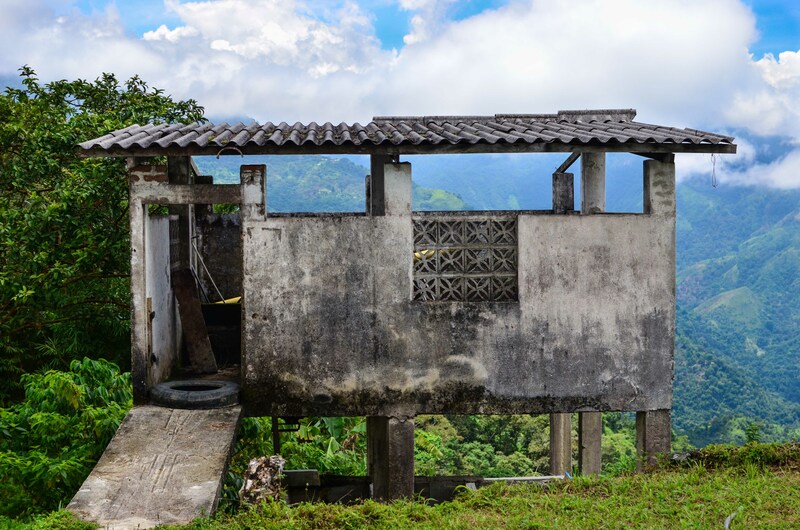 Halfway up the Sierra Nevada’s hearty base in northern Colombia, the tiny gathering of Minca lies within a zone of flora and fauna that can only be described as a mash up between mountainous and tropical bliss. 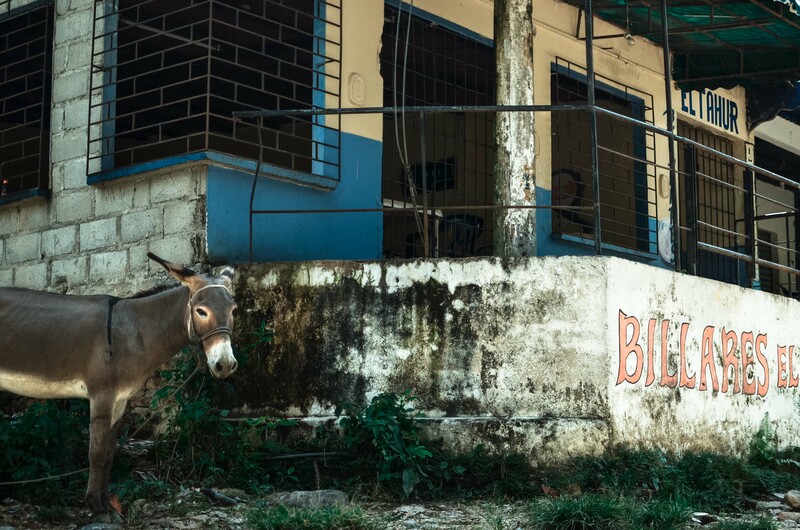 Only 45 minutes from the daily hustle of urban life in Santa Marta exists this tiny gathering of Colombians who chose the humming birds, cool climate, and quiet hills over the scorching concrete, modern life, and cargo ships. Getting there was not so blissful. Freshly tanned from our low-key beach tenure, we found ourselves once again waiting on Calle 11 and Carrera 11 for our collectivo to fill up with 4 riders before take off (a common prerequisite). We killed the wait time happily chatting with our driver on a listing street bench right next to his beat up Chevrolet. 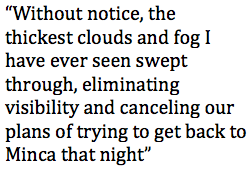 The dust from the ground lifted as passers by shuffled through the thick humid air of the city. Music blasting from a nearby TV gave the conversation a calm, relaxed pace that didn’t have to waste time worrying about the uncomfortable gaps of silence when our conversational Spanish ran out. We seemed to have enough people to leave but we had to wait for the delivery of goods purchased by a lady riding up with us. But it didn’t matter. 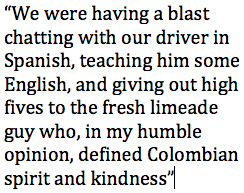 We were having a blast chatting with our driver in Spanish, teaching him some English, and giving out high fives to the fresh limeade guy who, in my humble opinion, defined Colombian spirit and kindness. A cart eventually pulled up with huge sacks of rice, oil, and a Television, which we quickly determined could not fit in the trunk or on the roof. So there we were, driving hap hazardously through the crumbly back roads of Santa Marta once again. There were 3 of us in the back of a an old Chevrolet with an oversize box television set bouncing off our knees. The lady who bought it had to have it on her lap the entire bumpy ride while Elissa did her best to not let it crush her legs. We went up the only road that cut the way to our destination through the zig zagged valleys of old, broken asphalt roads that had long ago been damaged by floods and rain. Minca came out of nowhere, and instantly took our minds off the efforts given to get there. A pristine river carried water from the mountain valleys above from pure rain, snow, and glaciers straight through the center of town. This natural gauge in the land was stitched up by a large steel railroad bridge, connecting the two halves of the village. Our rusty old car dropped us off at the taxi stand, which happened to be next to one of the few places in town that made deep fried potato and chicken balls on the street. This is known in my world as finding gold. There is nothing that I love more than street food. A cozy church was just beyond eyesight where our rough instructions told us was the beginning of the path to our new home. We were on the hunt for Casa Loma, which translates to “Hill House”. After a grueling 10 minute climb with all of our gear through switchbacks, front yards, and school houses we were panting, sweating, and dying at Casa Loma. The owner, Jay, greeted us with a hearty hello and offered us a mud and brick hut in the back side of the hostel on the cheap. Hammocks were hanging from the wooden beams in the open air communal hang out area along with tables, chairs, books, and an awesome array of music chiming away in the background. The scene was what every traveler looks for in a place, in my humble opinion. From the top of the hill, the view was absolutely stunning. 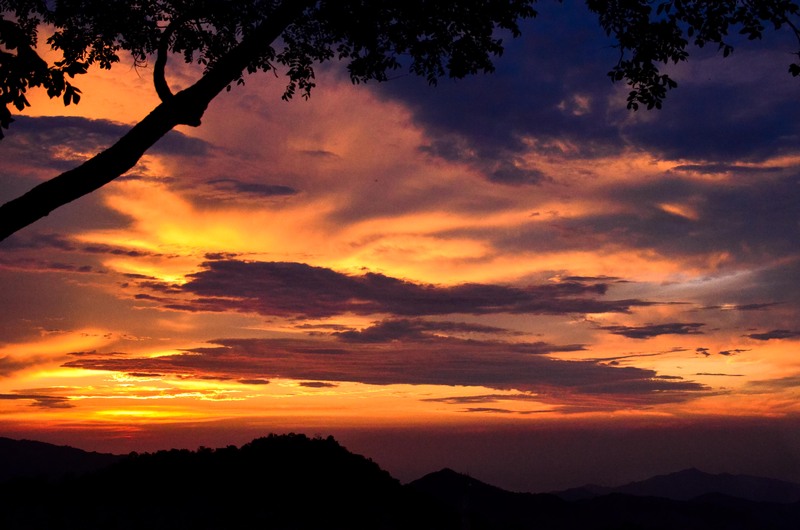 We were informed that ethereal sunsets were the norm up here, and that thunderstorms often illuminated the sky. 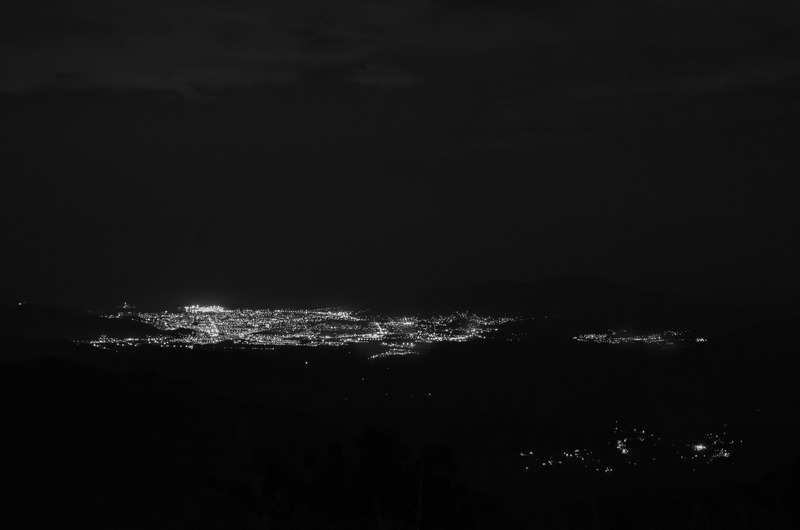 From our nest Santa Marta lay still in the distance, coming to life at night when the lights came on. As promised, we were gifted an amazing sunset the first night we stayed. I remember we were roaming around enjoying the almost unnaturally quiet village when it began to happen. Quickly, we stormed up the hill before the show was over. Travelers already enjoying the natural postcard that was beaming deep pink, orange, and red light laughed at our panting bodies as we crossed the finish line. The sight was unreal, and worth every breath used to transport us there. A lightening storm followed suit, perfecting the night and carrying our new found love affair with Colombia to soaring new heights. 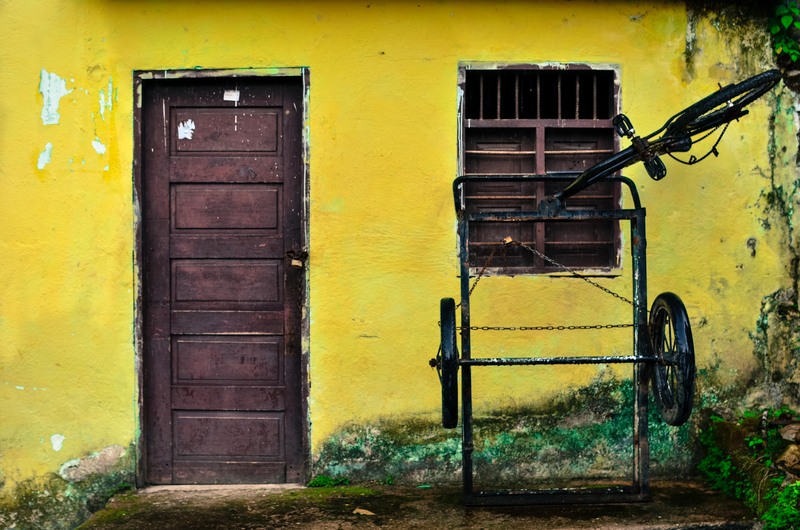 The town was inhabited by Colombian families who clearly knew what true, natural beauty was. There was also a small expat scene of those who held the same sentiments. It seemed like Minca was getting its initial dosage of steady tourism in small numbers. This was exhibited by the adventure activities advertized in the small booth at the town’s entrance. There were also several places to eat that were definitely not traditional Colombian enterprises, such as an organic coffee house, a pizza joint, and Chinese food eateries. 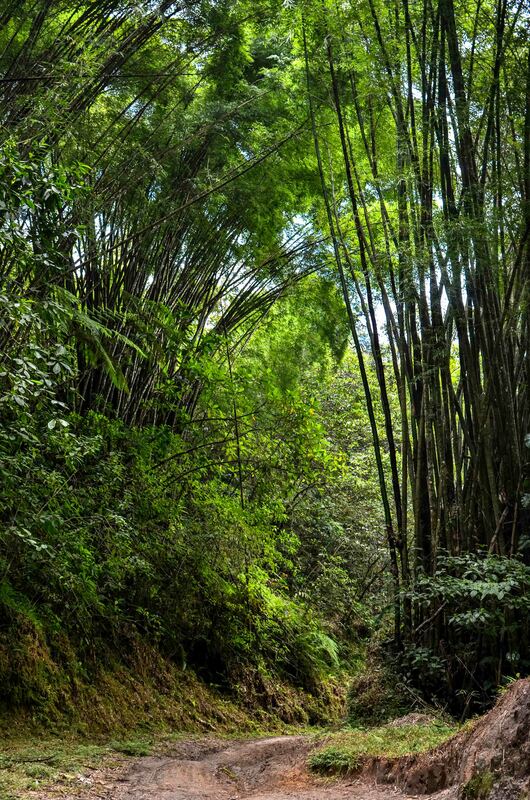 Roads leading into and out of town brought you through forests of massive, leafy trees and bamboo clusters roughly 25 meters high. 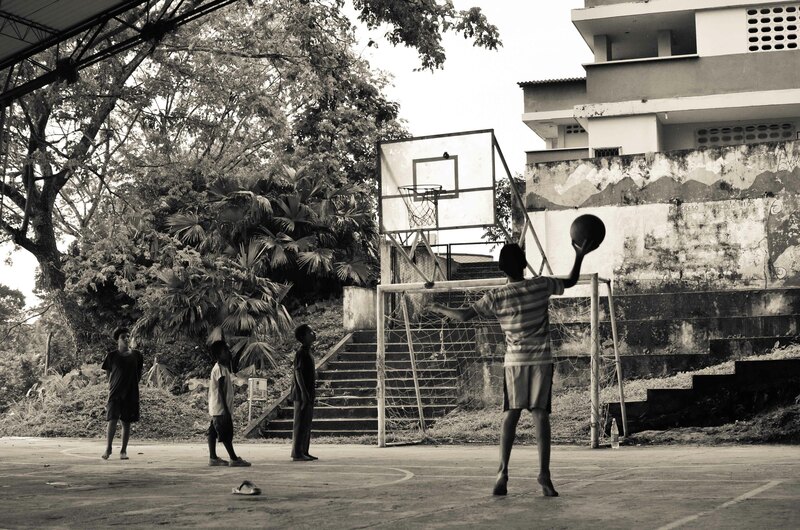 There were small, family run coffee farms nearby and plenty of watering holes to get wet in. 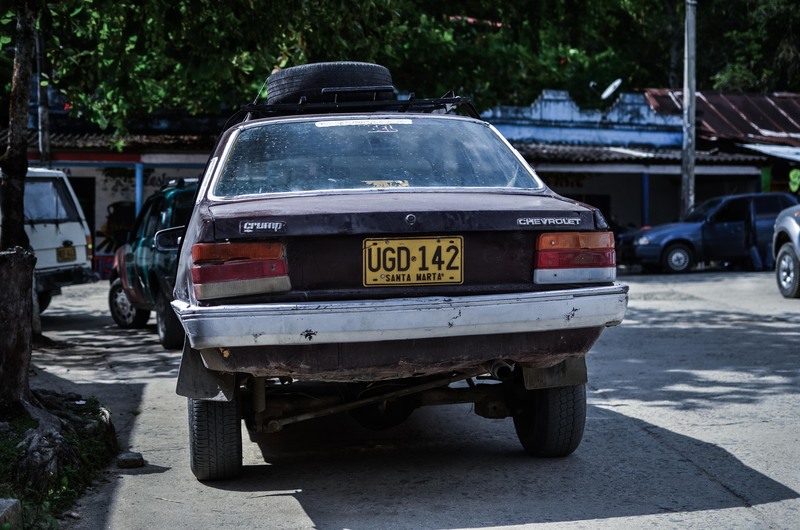 It seemed as if the heat that Santa Marta is famous for had tailed our brown Chevy through the winding hills and up to Minca. The sun was almost just as unbearable in town as it was beach side a few days prior. Contact with fresh, running water was the only answer to save us from its intense fortitude. Following some rudimentary instructions to a local watering hole brought us to one of the more popular local restaurants located right along the river. 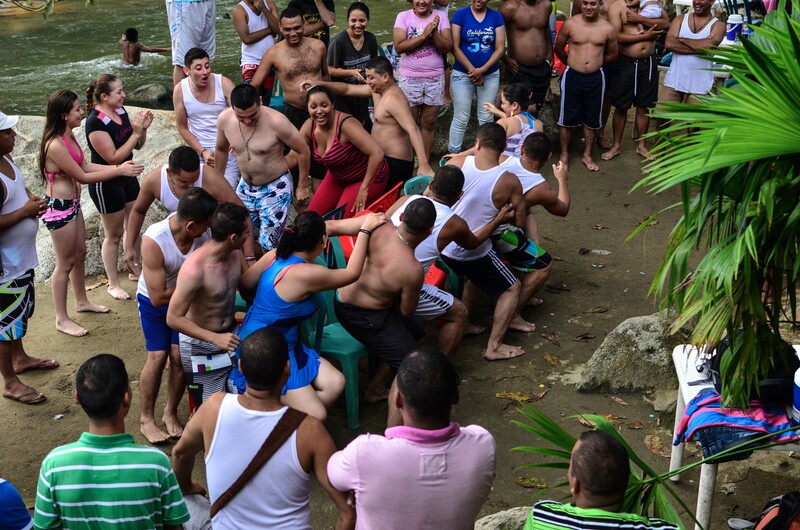 The meandering road ended at a stream that opened up into a full out Colombian birthday bash. 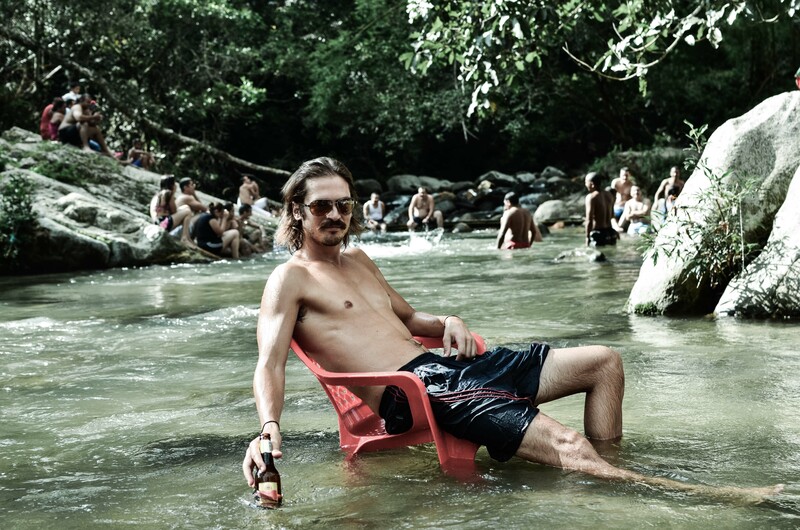 Plastic tables and chairs were half submerged in the deliciously crisp mountain water. Music was pumping from the speakers at levels that could only be described as Latin American. Everybody was in good spirits. Splash fights, upstream swimming races, and musical chairs were all brushed onto the canvas of our afternoon in deeply saturated hues of contentment. It was enjoying seeing grown men acting like kids, especially since maturity seems move at lightening fast paces in the developing world. The heat was officially confronted, and I do believe it lost the battle. The owner of Casa Loma informed us that he had stake in another hostel in the area called Los Pinos (the pines). To get there, ambitious travelers either had to hike four hours up a road up the mountain or pay to have someone drop you off near the entrance. 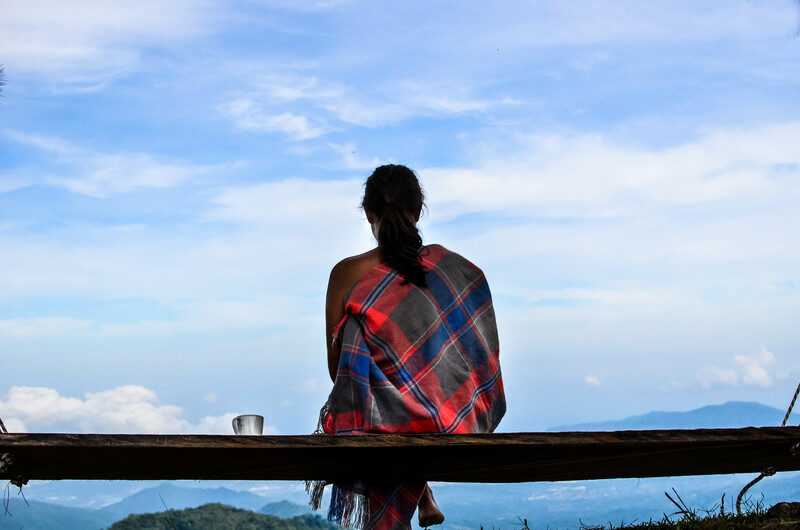 There were also an assortment of waterfalls, organic coffee farms, and the notion of breathtaking views along the way. We chose to hike. Just outside of town massive bamboo clusters shot out of the ground destined for the sky. They were like nothing I’ve ever seen before. They were like massive green fingers launching out of the ground, leaving a trail of organic water pipes behind. Later, we came across an old man drinking aguadiente (a Colombian liquor) with a friend in his shack by the side of the road. He kindly offered us some, and then asked all the usual questions. Afterwards, his friend gave us a lift in his pick up truck to the walkway entrance of a swimming hole we sought out. We thanked him and parted ways, meandering down a windy isolated path. After crossing a makeshift bridge, the trees opened up to tumbling falls that blanketed large, round monoliths of solid earth. The visual was breathtaking, as was the temperature of the water! After leaving the falls, it began to rain. I had high hopes that this was just an afternoon shower that normally disappears into a subtle, sunny afternoon, but this was not the case. The rain didn’t stop for the next 5 hours. We trudged uphill, soaking in our clothes, wondering why on earth we decided this was a good idea. Our boots began having the dreaded “sponge” effect, making cringe-worthy, but laudable, squishy noises with each and every step. The road would occasionally turn from asphalt into mud, which we were told was indicative of close proximity of the turn off we were now desperately looking for. Many, many times the mud would evolve back into asphalt, killing all hopes our saturated bodies had. Time slowed down to a stop. 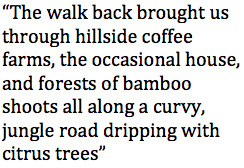 We walked for what seemed like days, passing the occasional house that was planted in the absolute middle of nowhere. Clouds were soaring between the valleys; sometimes opening up for a taste of the view we were missing. Eventually we met a farmer walking down the mud road, who confirmed that we were close. The intersection between two dirt roads appeared right next to the only store that supplied the region. 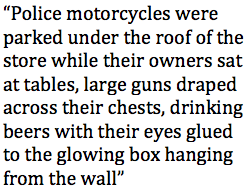 Police motorcycles were parked under the roof of the store while their owners sat at tables, large guns draped across their chests, drinking beers with their eyes glued to the glowing box hanging from the wall. We had to inquire about the entrance to the roadway we were looking for because we were losing light and couldn’t afford a mistake. Onward we marched up the muddiest, least kept road encountered to date. It appeared that even a 4-wheel drive vehicle could not have handled the road we needed to traverse. Surface runoff, probably in the form of rain torrents washed away portions of the steep, unpredictable terrain leaving large gouges throughout. It was noticeably darker now, and we were grumpy to say the least. Then, like magic, the rain just stopped. Next the clouds diminished. We then found ourselves dumbfounded by the raw beauty that sat stoically in front of us. Green, lush mountaintops glistened below our muddied feet. Huge, leafy plants held drops of water on their surface and became illuminated as the clouds started to thin out. A short distance later we came across three gigantic pine trees in front of an old guerrilla post, aka Los Pinos Hostel. We damn near kissed the ground. At first glance, the property looked as if nobody was home. A quick scan to soak in the utter beauty was in order. 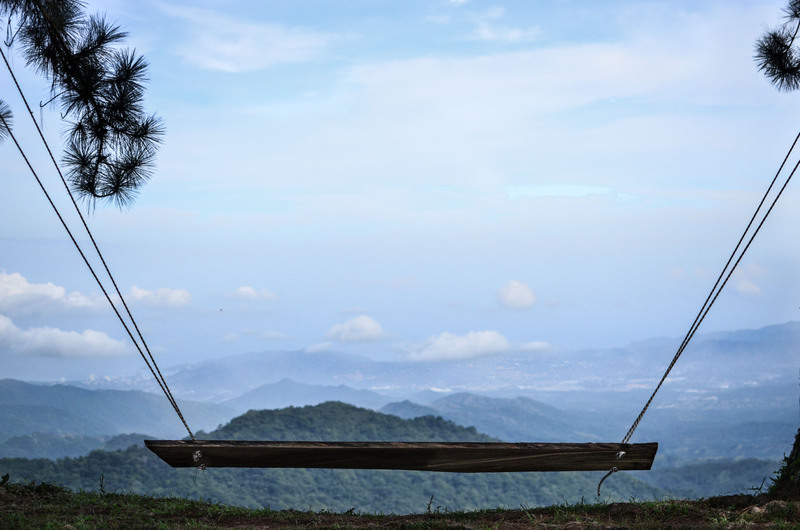 Wooden bench swings were connected to trees by rope and looked as if they were on the edge of the world. 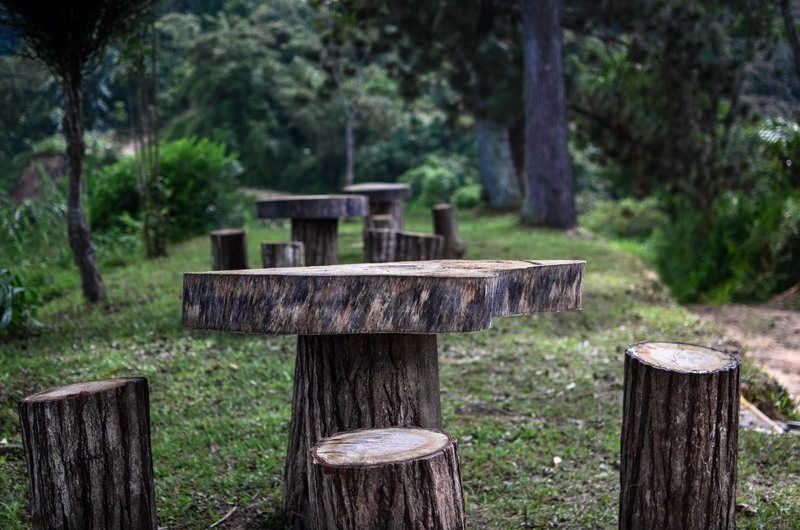 They were kept in good company by outdoor wooden tables constructed from chunky tree trunks. Fruit trees were stationed in the front lawn and clean, fresh air was in every breath. We heard the faint sound of music coming from the hostel and ventured over. We shouted a bunch of “Holas” until we finally heard a rustle. Enter Ed. Ed, an adventurous soul from England, occupied and ran the hostel that was literally the definition of “isolation”. 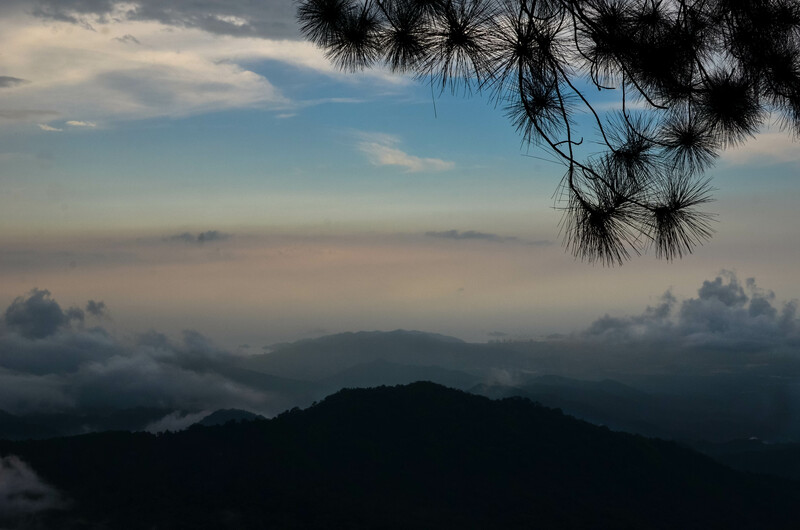 He claimed that you could see the tops of some of the highest points in Colombia in the Cerro Kennedy range around sunrise, and we had no reason to doubt him. He quickly invited us in to his “work in progress” adventure hostel and gave us some warm, dry blankets. We instantly began trading life stories, adventures, hopes, and dreams with this high-spirited chap. Without notice, the thickest clouds and fog I have ever seen swept through, eliminating visibility and canceling our plans of trying to get back to Minca that night. Ed gave his friend Jay a ring and let him know that we were stuck up in the wild for the night. Ed took care of our tired bodies by whipping up some delicious vegetable soup dinners while we took in an insanely beautiful lightening storm. Brief electric surges illuminated clouds in all directions, revealing every detail of our faces for small moments in time. After dinner, we pretty much had a triple date night watching laptop movies on the couch until we all couldn’t keep our eyes open. True to Ed’s promise, at 5am we saw the majestic snow capped peaks of the mountains in the early morning sunlight. Breakfast consisted of guava pancakes, Colombian coffee, and a hammock-induced nap. We watched the world unfold below us from our vantage point before making the trek back down. Ed gave us some rudimentary instructions on how to make it back and we started off towards Minca. 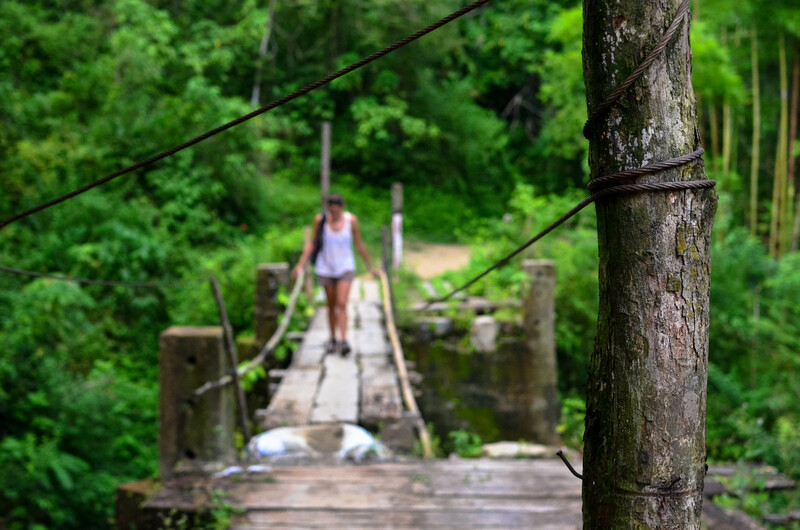 The walk back brought us through hillside coffee farms, the occasional house, and forests of bamboo shoots all along a curvy, jungle road dripping with citrus trees. It was a mountain bikers dream route; hairpin turns, cliff side sandy trails, and stunning views of the valleys from top to bottom. When we eventually leveled out to the valley floor, trees towered over us in all directions. It had the feeling of being a ladybug walking through a late season hay field. 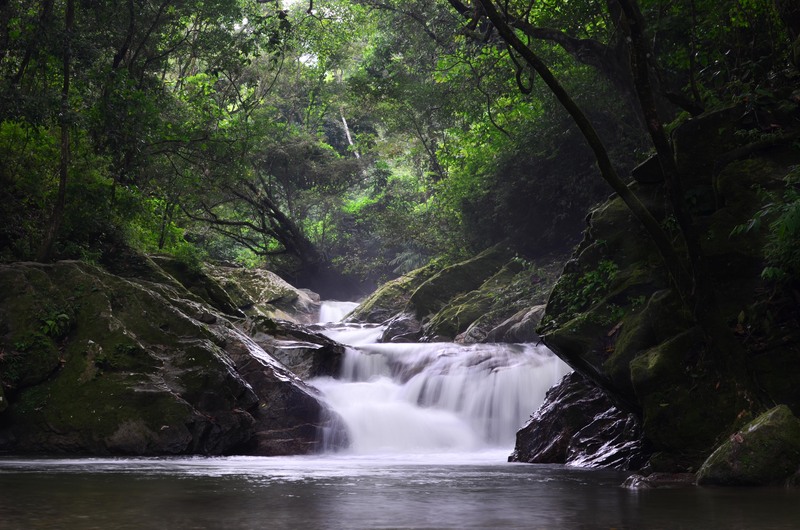 We were walking alongside a gorgeous mountain creek, and the soft sound of moving water followed us all the way home. When we arrived back at the hostel, we told Jay of our adventures and mishaps in some of the most breathtaking settings we’ve ever seen. After hearing about what kind of things we enjoyed, Jay convinced us that we needed to go check out Punta Gallinas, which is the northern most point in South America. We had been tossing the idea around in our heads but dismissed it because of the pain of getting there and the cost associated with it… until we had that conversation with Jay. We left Minca the following morning and began trying to assemble the pieces of how to put the transportation puzzle together. Thank you! That waterfall was amazing, well worth the trip. What an amazing adventure you just took me on. I love south America and Colombia in particularly. I’ve been there 3 times and now leading a yoga and writing retreat in Santa Marta. …or a little oasis out of town. A trip to Minca is on the agenda and I’ve just shared this with the group. Thanks.